...thinks that it is possible that God may be calling you to the monastic or religious life, would like to talk to one of the nuns, and/or is interested in visiting or attending an upcoming discernment retreat? Then fill out our Vocation Inquiry Form! What is unique about Christ the Bridegroom Monastery? Visit the "About Us" tab to learn more about the particular ways that God is calling our monastery to be a "reference point" in the heart of the Church. If these characteristics attract you, perhaps God may be calling you to life in our monastery! Explore this blog and fill out the Vocation Inquiry Form. Find someone you trust to confide in and help you in your discernment. More stories to come later! A call to the monastic life is a call to relationship—with God, the monastic community and the Church. Therefore, each inquirer will be guided in exploring and developing her relationship with each, and should remain open to the voice of each in her discernment. The inquirer is a woman who is seeking God’s will in her life and feels called to the possibility of monastic life. 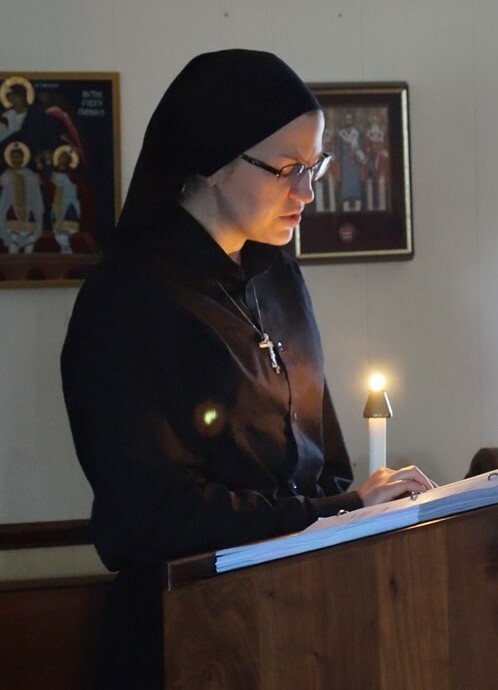 She is given basic information about the purpose of Byzantine monasticism and the prayer life, hospitality and way of life of Christ the Bridegroom Monastery. The inquirer is graced with the opportunity to dialogue with a spiritual mother during her visits and is given the opportunity to participate in the rhythm of the daily prayers and works of the monastery, as well as share in meals and recreation with the nuns. Through prayerful discernment and after a significant period of visitation and familiarity with the monastery, the inquirer, if she feels drawn to a more intimate relationship with Christ the Bridegroom, and with the permission of the Hegumena, may come to the monastery as an observer. The observer spends three to six weeks at the monastery to further clarify her discernment of monasticism. She participates as much as possible in the prayer, common works and recreation of the monastery. With the permission of the Hegumena, the observer may undertake the application process to become a dokimos. The dokimos (postulant) is one who seeks a trial period of living the monastic life. She wears simple clothing consisting of a long skirt, long sleeved blouse and a head covering. This trial period lasts about twelve months, with a possible extension of six to twelve months. The rasophore (“robe bearer”) is a nun of the first degree. The dokimos becomes a rasophore during a liturgical service in which she is tonsured and, as a sign of commitment, is given the long-sleeved dress, apostolnik (veil), belt, riassa (robe) and skufia (hat). A new monastic name, chosen by the Hegumena, is given at that time by the Bishop. The dokimos may suggest up to three names to be prayerfully considered by the Hegumena. Although the rasophore does not make a profession, she is morally obligated to the complete discipline of the monastic life. The first year of rasophorate is a time of limited communication with those outside the monastery so that the nun may learn to depend on her Bridegroom alone. The rasophorate lasts approximately three years (Canon 457 §1). 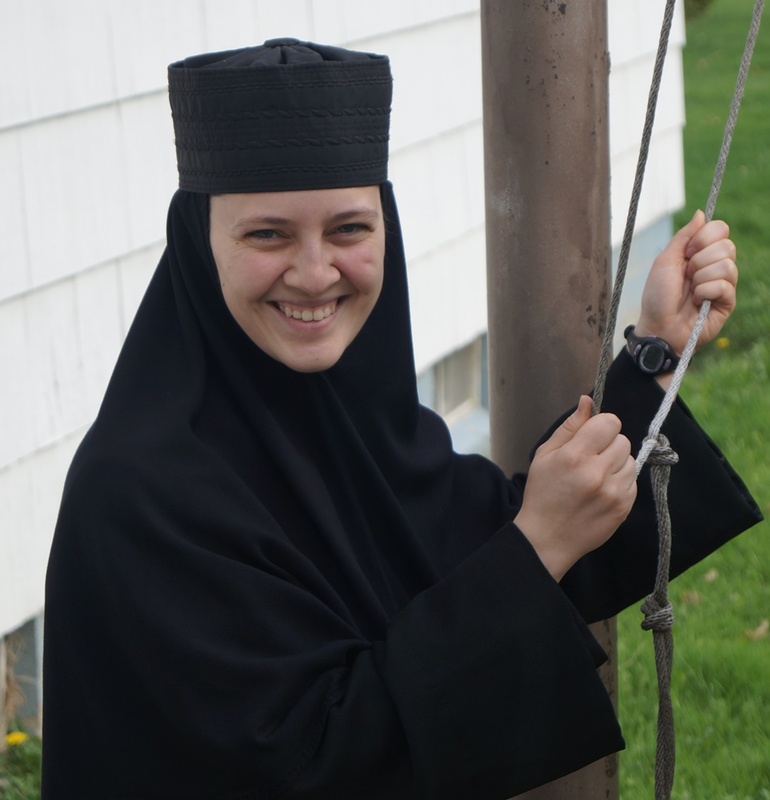 After the completion of the three-year rasophorate, the rasophore will request to make her life profession and be tonsured as a stavrophore nun or she may request to extend her rasophorate up to a year (Canon 461 §2). 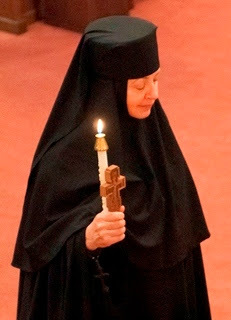 The second degree of monasticism is the stavrophore nun (“cross bearer”). The nun is received as a stavrophore during a liturgical rite adapted from the Great Euchologion, is tonsured, makes her monastic profession and receives the klobuk with veil, the paramandyas [with its cross], the mandyas, the chotki, a hand-cross and a candle. At this point, the nun is espoused to Christ as His bride. She experiences the fullness of monastic life, sharing in the passion, death and resurrection of her Bridegroom. She is given the title of “Mother” to express the fruitfulness of this union. Before the nun is tonsured as a stavrophore she relinquishes all monies, possessions, property, etc. At this point, the nun is committed to remain for her lifetime in Christ the Bridegroom Monastery.